The periodic table of the chemical elements is a tabular display of the chemical elements. It is perhaps the icon of Chemistry and expresses much about the physical and chemical properties of the known elements. The emergence of the periodic table occurred concurrently with the development of the scientific understanding of the composition of matter. In its current form, it owes much to quantum mechanics. The electronic structures derived from quantum mechanics are used to explain theoretically the experimentally observed periodic variations in properties of the elements. The periodic table is one of the essential components of our understanding of the universe and underlies all of chemistry. This was followed by the English chemist John Newlands, who noticed in 1865 that the elements of similar type recurred at intervals of eight, which he likened to the octaves of music, though his law of octaves was ridiculed by his contemporaries. Finally, in 1869, the German Julius Lothar Meyer and the Russian chemistry professor Dmitri Ivanovich Mendeleev almost simultaneously developed the first periodic table, arranging the elements by mass. However, Mendeleev plotted a few elements out of strict mass sequence in order to make a better match to the properties of their neighbors in the table. He also corrected mistakes in the values of several atomic masses, and predicted the existence and properties of a few new elements in the empty cells of his table. Mendeleev was later vindicated by the discovery of the electronic structure of the elements in the late nineteenth century and early twentieth century. The modern table is based on this understanding of the electronic structures. In 1913, Henry Moseley rearranged the table according to atomic number to improve the observed periodicity in the chemical properties across the table. Today's table uses this ordering by atomic number (number of protons). Mendeleev's and Moseley's development of the periodic table was one of the greatest achievements in modern chemistry. Chemists were able to qualitatively explain the behavior of the elements, and to predict the existence of yet undiscovered ones. In the 1940s Glenn T. Seaborg identified the transuranic lanthanides and the actinides, which may be placed within the table, or below (see the different possible arrangements below). Elements numbered in red are gases. Elements numbered in green are liquids. Elements numbered in black are solids. Elements without borders have not been discovered/synthesized yet. Elements with dotted borders do not occur naturally (synthetic elements). Elements with dashed borders naturally arise from decay of other chemical elements. Elements with solid borders are older than the Earth (primordial elements). Note: Although californium (Cf, 98) is not Earth-primordial, it (and its decay products) does occur naturally: its electromagnetic emissions are regularly observed in supernova spectra. The standard table (shown above) provides the basics. A vertical table for improved readability in web browsers. The large table provides the basics plus full element names and atomic masses. A table with an inline F-block inserts the lanthanides and actinides back into the table. Each element appears in a box which contains the symbol of the element and its atomic number. Many tables also include the atomic mass, and some have additional information as well. The fundamental ordering of the elements is as a list according to their atomic number (number of protons). 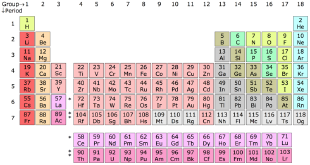 As of 2005, the table contains 116 chemical elements whose discoveries have been confirmed. Of those 94 are found naturally on Earth, and the rest are synthetic elements that have been produced artificially in laboratories. Following this basic order the elements are arranged in a table that contains specific columns and rows, known as groups and periods respectively (see the above table). The columns of the table are known as groups or families. All the elements in a group have similar properties. Placing elements in groups is one of the most important ways of classifying them. There is some variation in properties within a group, but the changes are relatively small as one goes down (or up) the group. Each group of elements forms what is called a chemical series. There are three ways of numbering the groups of the periodic table. The standard International Union of Pure and Applied Chemistry (IUPAC) system is to simply number them 1 though 18 as in the table above. There are also two older systems using Roman numerals. The Roman numeral names are the original traditional names of the groups; the standard IUPAC system replaces the old names in an attempt to reduce the confusion generated by the two older, but mutually confusing, schemes. Some of the groups have special names (see below). Groups 1, 2, 13, 14, 15, 16, 17, and 18 are also collectively known as the main group, or representative, elements, and groups 3 through 12 are the transition metals. There is considerable confusion surrounding the two old systems in use (old IUPAC and CAS) that combined the use of Roman numerals with letters. In the old IUPAC system the letters A and B were designated to the left (A) and right (B) part of the table, while in the CAS system the letters A and B were designated to main group elements (A) and transition metals (B). The former system was frequently used in Europe while the latter was most common in America. The new IUPAC scheme was developed to replace both systems as they confusingly used the same names to mean different things. The shape of the periodic table and the placement of an element in a particular group or period is derived from the electronic structure of the atoms of the element. In fact the chemical and physical properties of an element derive from it's electronic structure. Thus it is the electronic structures of the elements that are the source of the observed periodicity of properties and the groups and periods of the periodic table. The electronic structures of the elements derive from quantum mechanics. The quantum mechanical description of an atom suggests that the electrons have a complex, but precise organization surrounding the atomic nucleus. The electrons are organized primarily into shells of increasing size and energy, which are numbered sequentially beginning with 1 as the lowest energy. The shells contain subshells which can be represented by letters. The most common subshells are s, p, and d. The subshells are in turn comprised of orbitals, where each orbital can contain two electrons. Of particular importance are the electrons in the highest energy (outermost) shell. These are the electrons that determine the position of the element in the table and are primarily responsible for the properties of the element. In the main group elements these outermost electrons are known as the valence electrons. The elements in a given group all have the same number of valence electrons, but they reside in successively higher shells as you go down the group. This is what gives the elements in a group similar properties. For example all the main group elements with four valence electrons are in Group 14 starting with carbon. They all have their valence electrons in s and p subshells. Those four s and p electrons will behave similarly regardless of shell they are in. In addition to dividing the table into groups and periods the table can be divided into blocks (see Periodic table filled by blocks) where the last subshell in which the atom's outermost electrons reside determines the "block" to which it belongs. Carbon, for example, is in the p-block because its last electrons are in the p subshell. Hence the structure of the table. Since the outermost electrons determine chemical properties, those with the same number of valence electrons are grouped together. Bouma, J. 1989. An Application-Oriented Periodic Table of the Elements. J. Chem. Ed. 66:741. All links retrieved February 7, 2019. Periodic Table. Large full-color scalable. This page was last modified on 8 February 2019, at 01:11.